As you should already know, Mother's Day is coming up on Sunday. Do you have your gifts purchased yet? This year I am totally prepared. Aside from a last minute trip to the grocery store for some dinner and dessert necessities, I'm ready to go. Regardless of whether your shopping is done or you'll be scrambling on Saturday to find a gift, it is always nice to add in a little something extra. Chocolate covered strawberries are one of those extras that will be appreciated by anyone, anytime of the year. Buying them at a chocolate shop can be pretty pricey and you'll get a few in a box. That makes them special, but sometimes you'd like a few more.....especially if you want to enjoy them yourself. 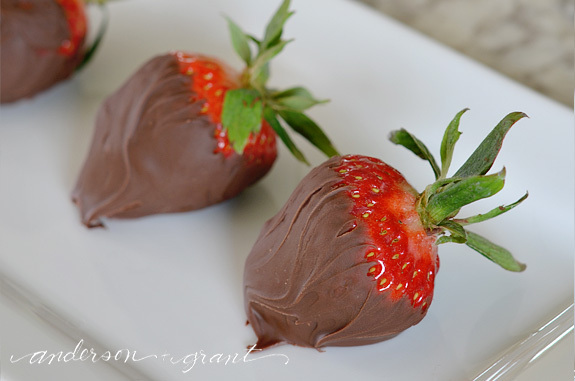 I've been making chocolate covered strawberries for quite some time and assumed that everyone knew how to do it. But recently, I found myself explaining to a friend just how to do it. Sometime we decide that because we know how to do something, then everyone else must know how to do it as well. That isn't always the case. 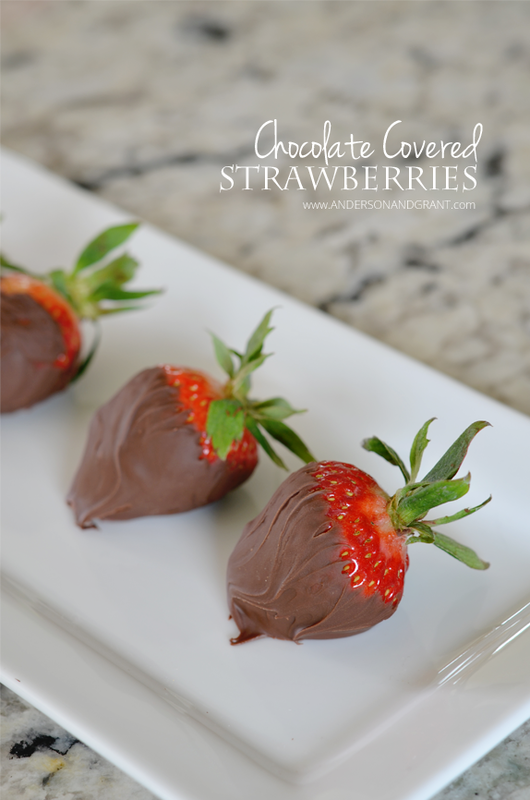 I thought I'd share my tips for perfect chocolate covered strawberries with you today on the chance that you might not know how to make them either. How much easier can you get for ingredients?!?! The most important tip for making chocolate covered strawberries is that the strawberries need to be room temperature. If you take the fruits out of the refrigerator and dip them in the hot chocolate, it will not harden properly. When you bite into the strawberry, the chocolate will break away in chunks. 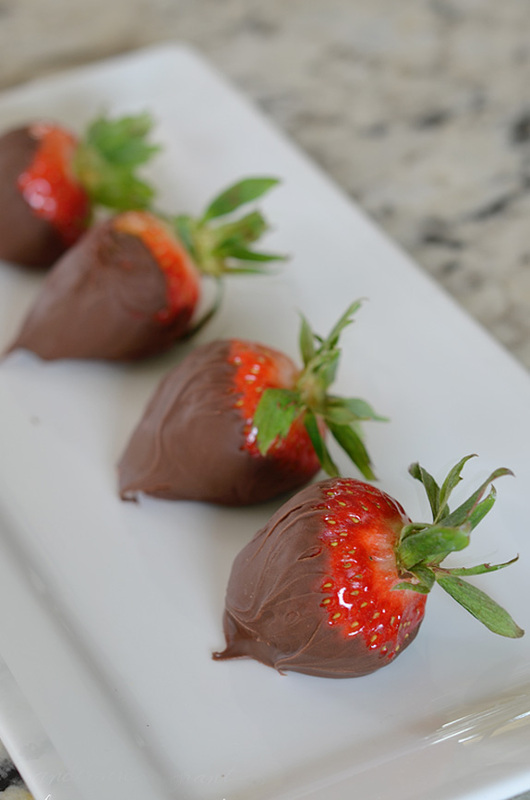 Using a warm strawberry allows the chocolate to harden evenly. The amount of chocolate you'll need will be determined by how many strawberries you are making and how large they are...take your best guess at the amount to melt. You can always add in a a few more chips if you haven't made enough. Both baking chocolates from the candy store or regular chocolate chips from the grocery store work for this recipe. It also is totally up to you whether you choose milk chocolate, dark chocolate, or white chocolate chips. 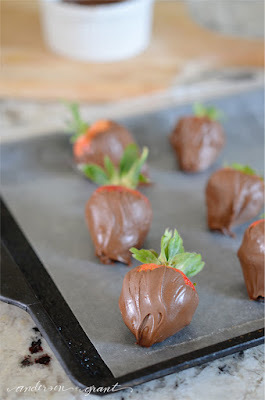 When the chocolate is melted, dip your strawberries and lay them out on a tray covered in waxed paper or parchment paper. Set the tray in the refrigerator for a short time to completely harden the chocolate. 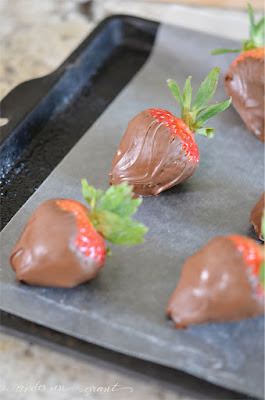 If you want to really make your chocolate covered strawberries fancy, drizzle them with another type of chocolate when the first coat has hardened. You can also dip them in some chopped nuts or sprinkles. The strawberries can be packaged up to give them as a gift or dig in and eat some yourself! They will last for just a couple of days after being coated with the chocolate. Easy enough? 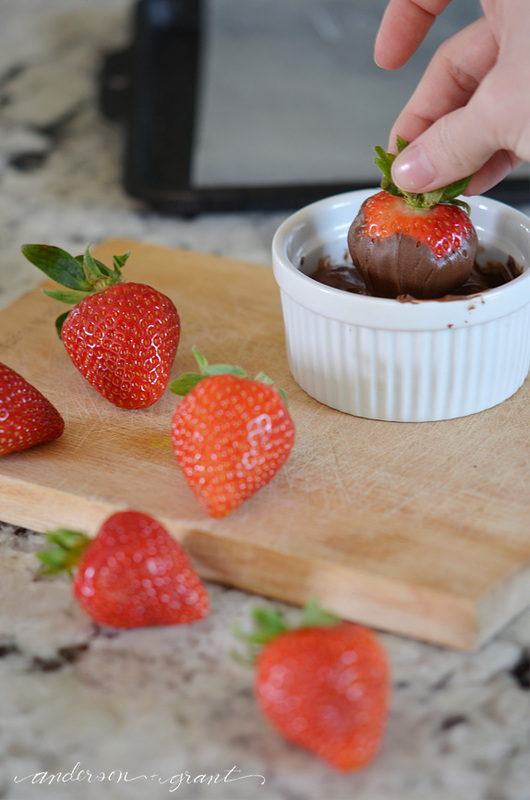 Now it is your turn to head to the grocery store, pick up some strawberries and get dipping!